This post could also be titled, “Kim & Robby Eat Their Way Across Oahu,” or, perhaps, “The Longest Post Ever,” ha. 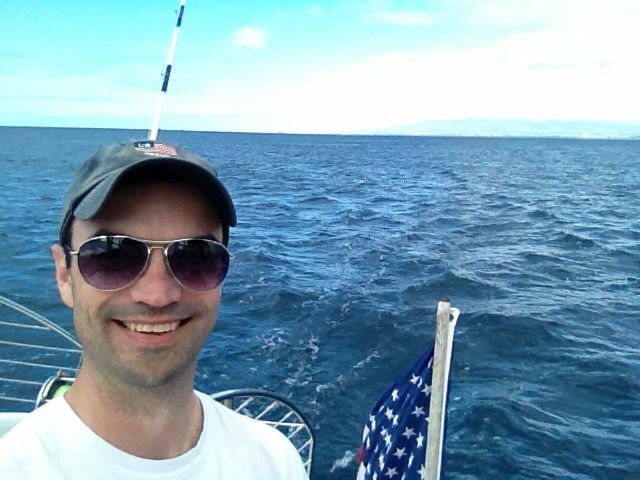 About a month ago, Robby started getting a hankering for a tropical vacation. We’d been squirreling away frequent flyer and hotel points, and we had just about enough for 2 round-trip tickets to Hawaii and 4 nights in a hotel. We have a pretty busy few months coming, and the only week that seemed to work was the first week of February. We hemmed and hawed a bit, and finally on a Tuesday we pulled the trigger and booked our trip to begin just 5 days later! Bright and early Sunday morning, we made our way to LAX and boarded our flight to Honolulu. Five and a half hours later, we touched down around lunchtime in a warm tropical paradise! 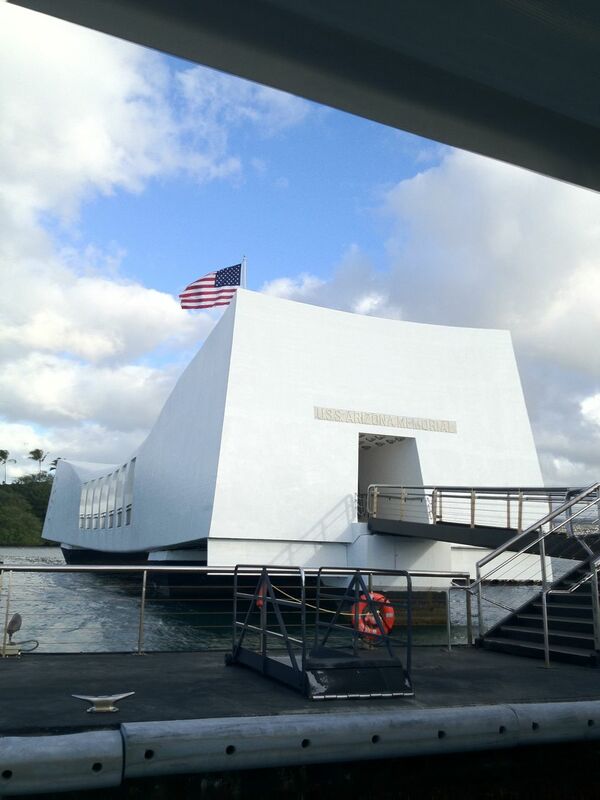 Our initial plan was to head straight over to the Pearl Harbor memorial, but once we got there we discovered they were out of tickets for the day. 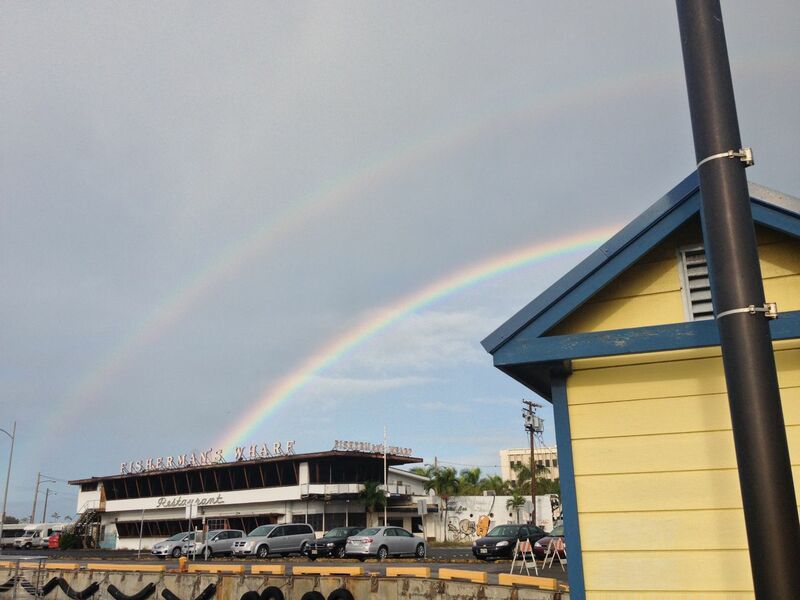 This actually turned out to be a blessing, because as we were re-grouping in the Pearl Harbor parking lot, we discovered that we had left one of our bags at the rental car lot. 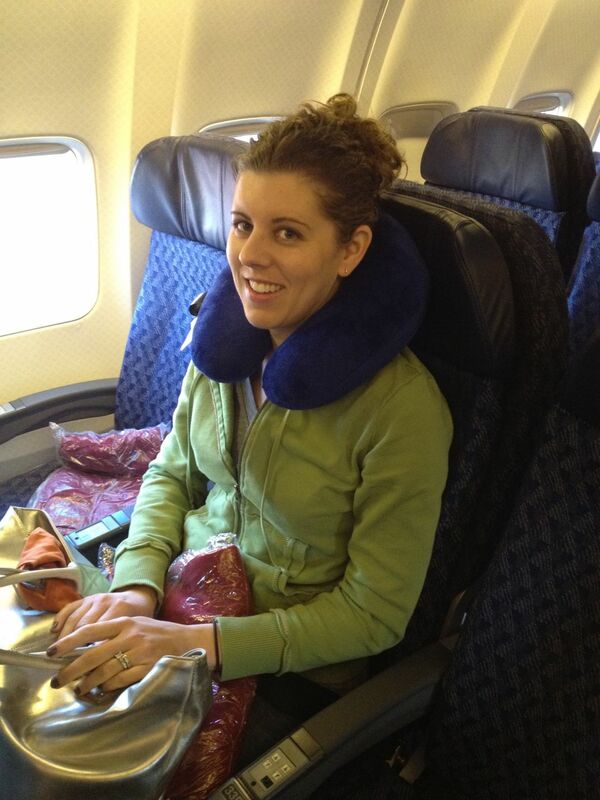 Of course, it was the bag that held our tablet computer and all of our travel documents. D’oh! We raced back to the rental place, and, praise the Lord, our bag was still there. We were kind of shaken up at that point, so we headed to the nearest Jamba Juice to re-plan our afternoon. 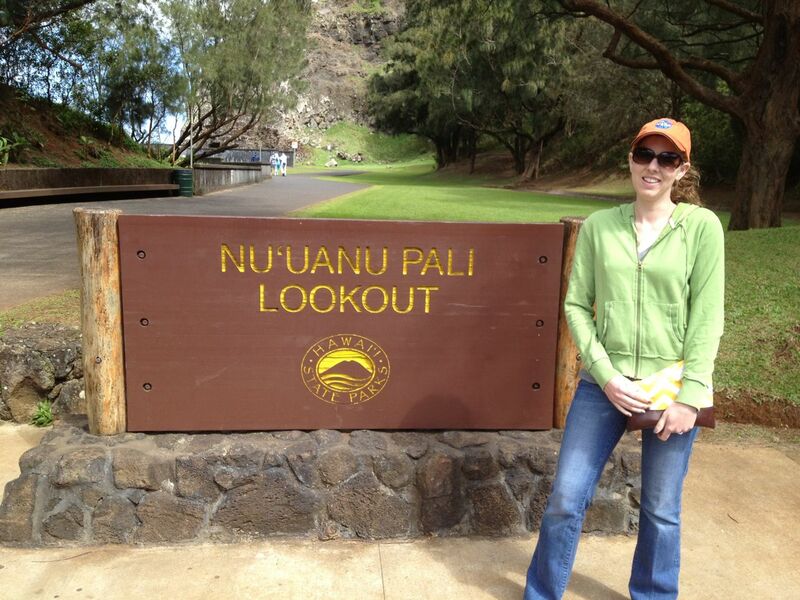 We decided that we would drive over to the “windward” side of the island to see some of the lookouts and beaches. 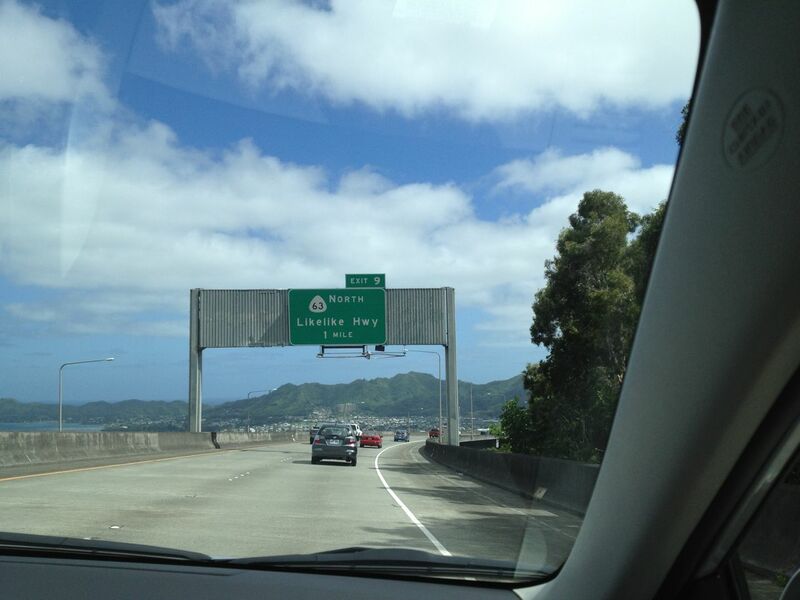 Great views from the Likelike Highway! 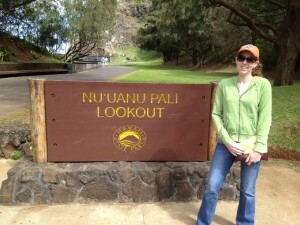 Our poor little rental Corolla struggled to make it up and over the mountain, but we finally arrived at the Nu’uanu Pali Lookout. 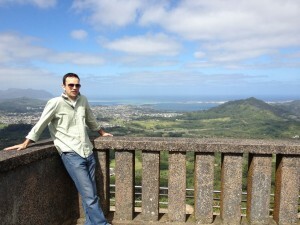 It was terrifyingly windy, but offered an amazing view of the eastern side of Oahu! And, strangely, there were about a dozen chickens running around. Robby looking out on Oahu. Panoramic shot from Pali Lookout. 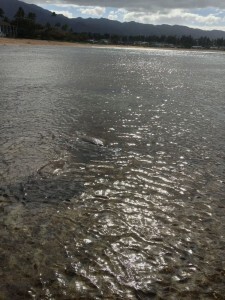 After we’d had enough of the feeling that we were going to be blown off the mountain, we headed over to Kailua beach to revel in the warm weather and gorgeous scenery. 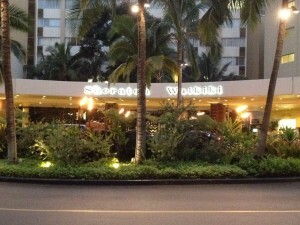 We then drove back across the island to check in to our hotel, the lovely Sheraton Waikiki on Waikiki Beach. 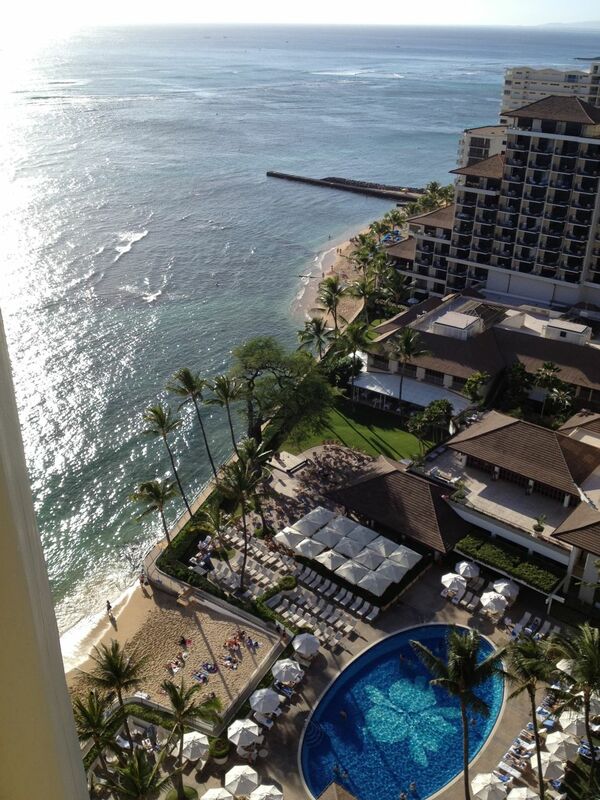 View from the 21st floor. After depositing our bags in our room (on the 21st floor! 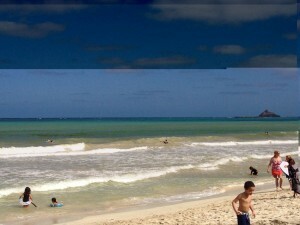 ), we set out to explore Waikiki on foot. 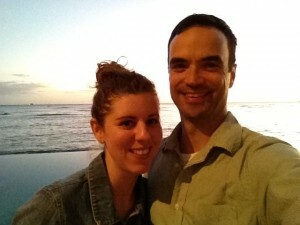 Our first stop was dinner…at PF Chang’s (I know, I know…not very adventurous of us. But we were hungry, and Robby was interested in seeing the end of the Super Bowl!). At dinner, I had my first-ever Mai Tai. Yum!! After we had eaten, we wandered past the expensive shops in Waikiki, then got some Kona coffee and watched the sun go down. 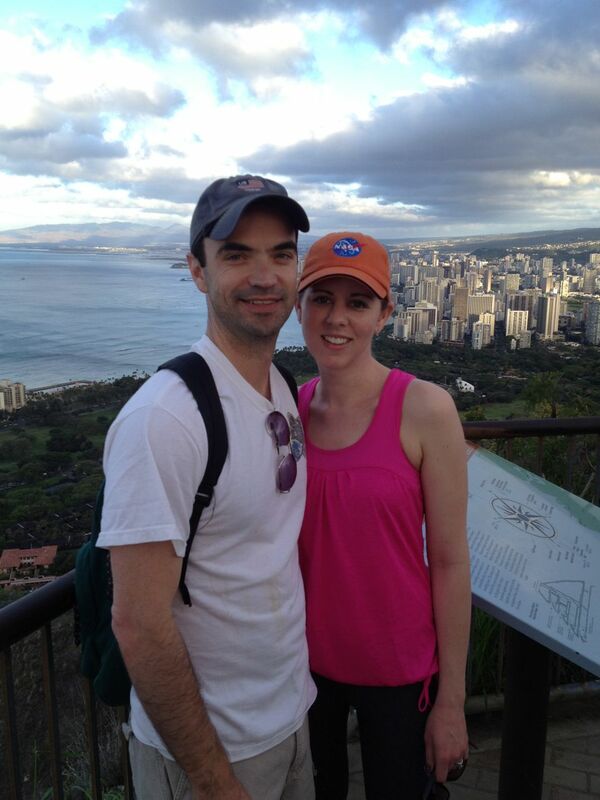 The next morning, we got up before sunrise to hike the Diamond Head trail. 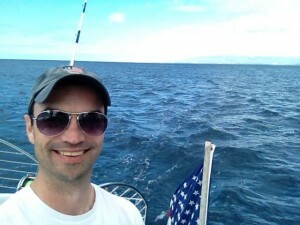 (Because we were only in Hawaii for 4 days, we decided to stay on LA time–2 hours ahead of Oahu. This ended up being a great decision, since we could pack more activities into our day and take advantage of early-bird food specials). 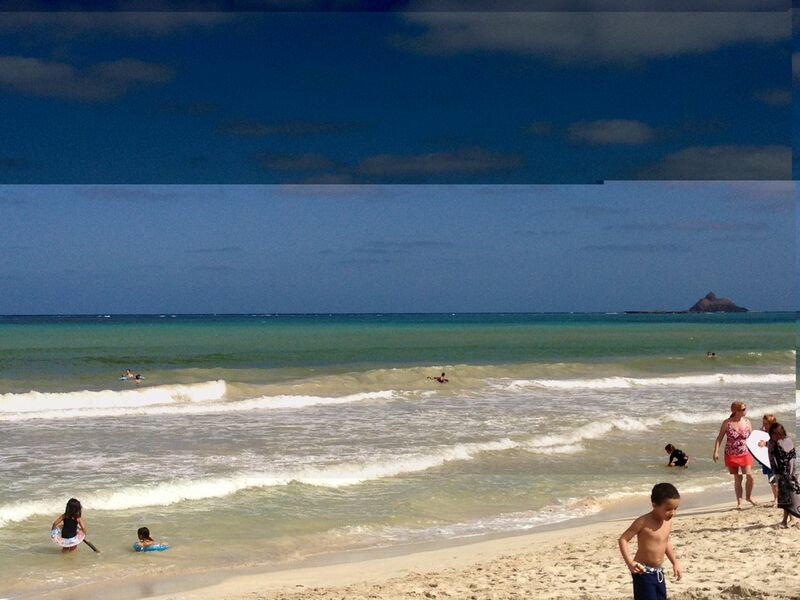 Diamond Head is a volcanic crater and the home of an old army bunker/lookout station. The trail was moderately steep, and involved a couple of narrow tunnels and steep staircases. We were feeling pretty good about our progress, until a huge tour group of little old Asian ladies passed us, haha. The view from the top of Diamond Head was incredible. So worth the early-morning effort! 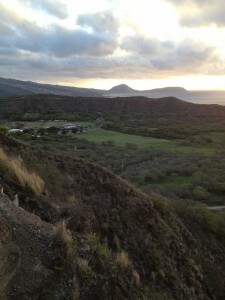 View from the Diamond Head trail. 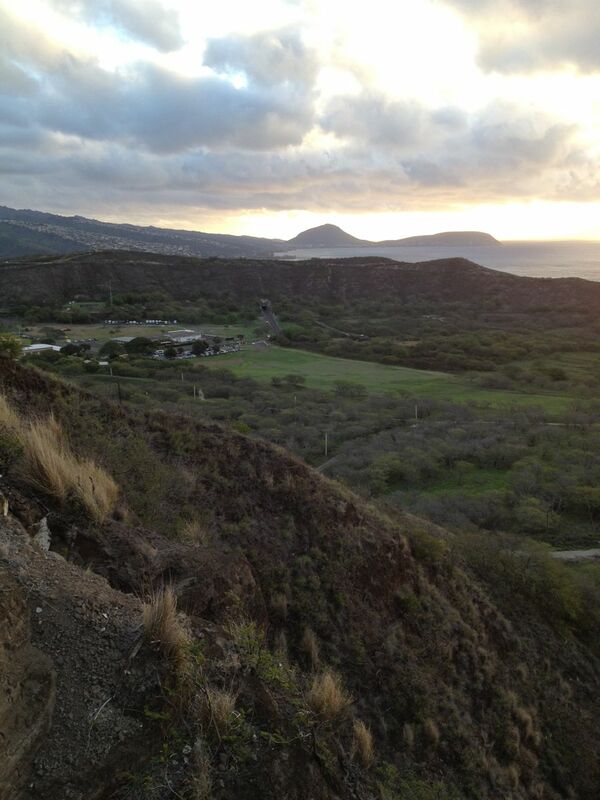 View from the top of Diamond Head! After our hike, we rewarded ourselves with some malasadas (Portugese doughnuts, which are apparently popular in Hawaii). 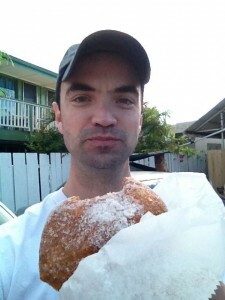 The malasadas were fresh from the fryer and SO GOOD! If you're ever in Honolulu, you must visit Leonard's for malasadas! 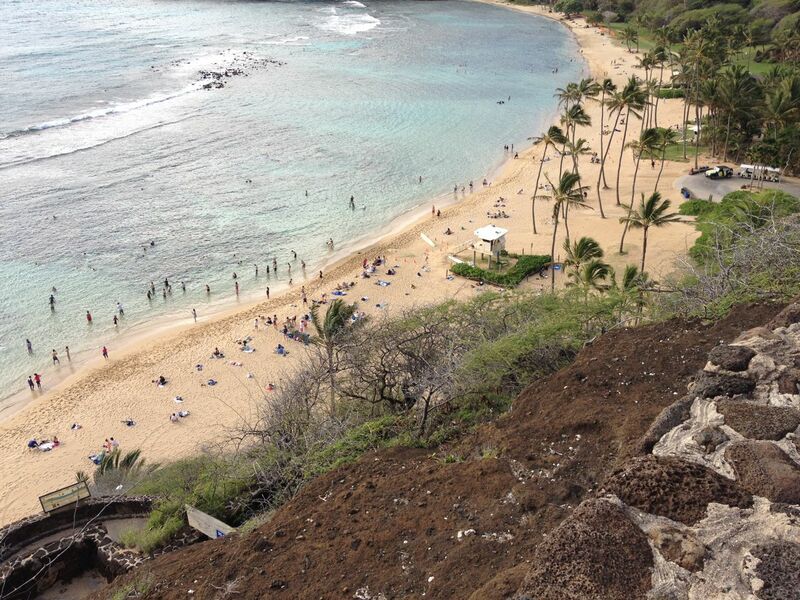 Our next stop was a lookout over Hanauma Bay, a popular snorkeling spot. We considered snorkeling, but it was kind of expensive, so we just wandered around and looked at the scenery instead. 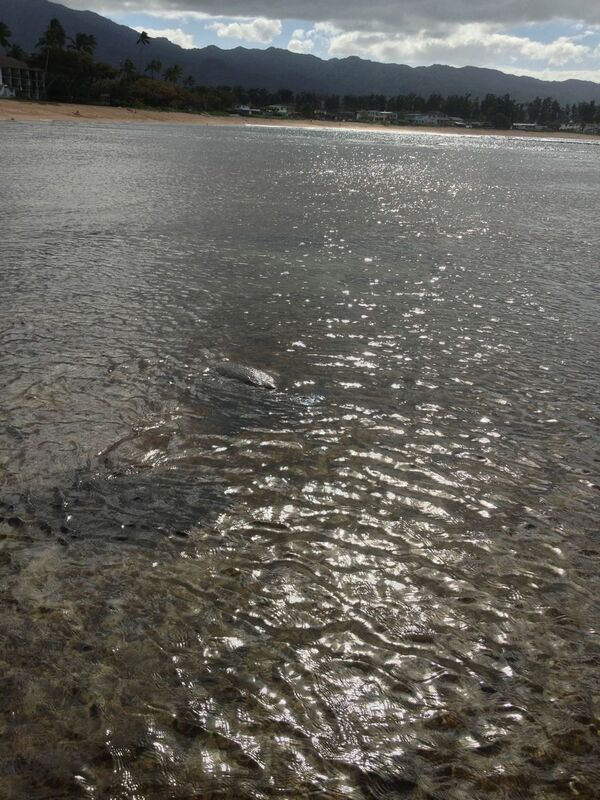 Someday, I’d like to go back and snorkel here, though! 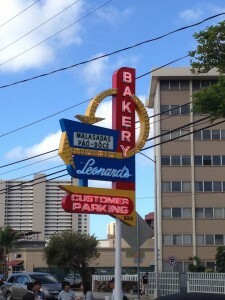 On the way back to Waikiki from Hanauma, we passed a Costco and decided to stop for hot dogs. 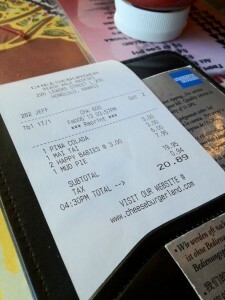 We were trying to keep our food costs down, and you can’t beat $1.50 for a hot dog and soda. After lunch, we drove back to the hotel and lounged by the pool–our only lazy experience of the whole trip!–before an early dinner and an evening of watching HGTV in the hotel room. Relaxing by the hotel pool. Tuesday morning started bright and early (7am!) at Pearl Harbor. We were lucky enough to get tickets for the first boat of the day, and spent the morning exploring the monument and a few of the many museums. I love museums (hey, I was a history major! ), but after a few hours I was feeling a bit of information overload. 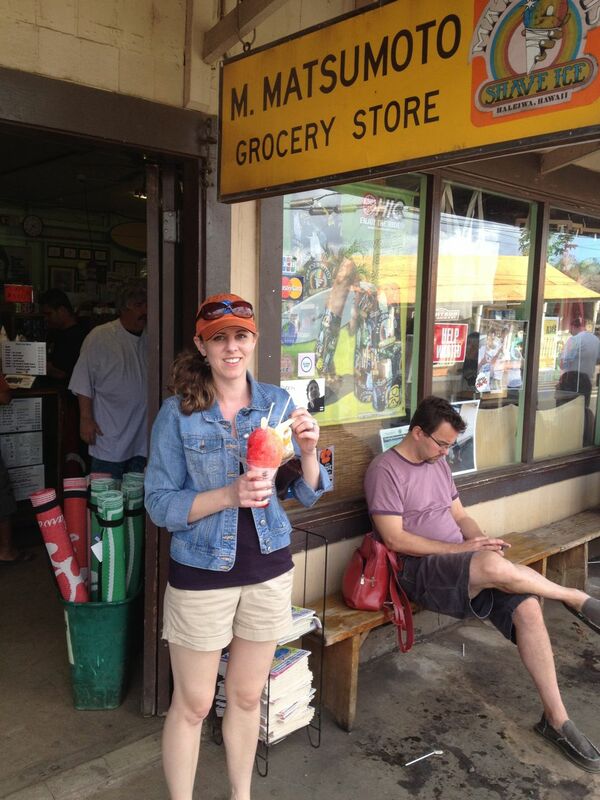 So, we ate a quick lunch and headed out to explore the North Shore. 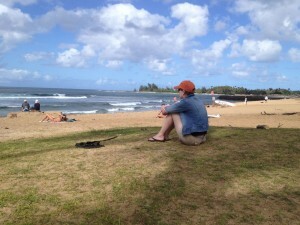 After driving past the Dole pineapple fields, we ended up at Haleiwa Ali’i Beach park. We waded out into the water and found 2 more turtles swimming nearby. It was so neat! 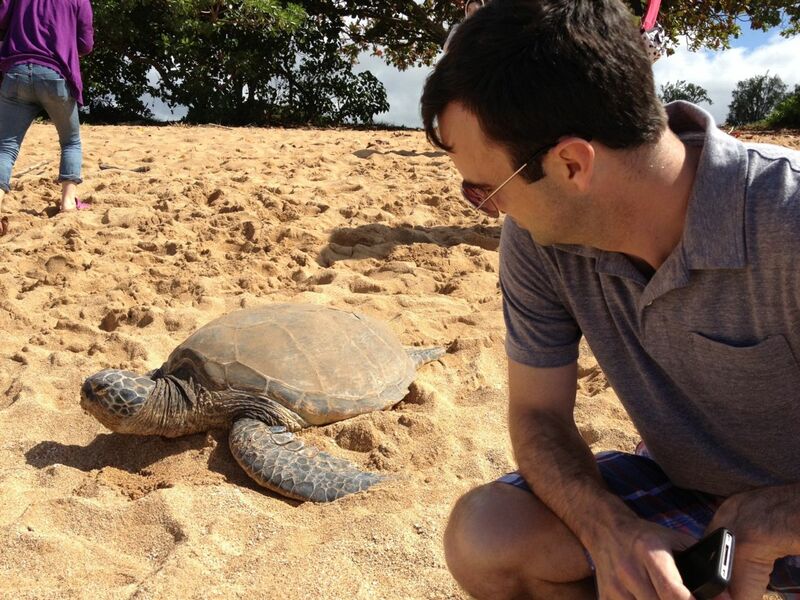 Can you see the two turtle shells? The cherry on top of our North Shore afternoon was splitting a huge shave ice at Matsumoto’s. 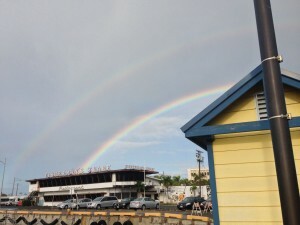 We ran into a bit of traffic on our way back to Waikiki, but a yummy dinner at Kona Brewing Company more than made up for it. After dinner, we were so tired we fell asleep around 8pm, ha. Wednesday was our last full day of vacation, so we decided to make the most of it by getting up early (again!) 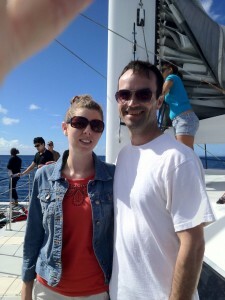 for a catamaran cruise around Waikiki Bay. The highlight of our ride was seeing a huge pod of dolphins swimming past the boat! 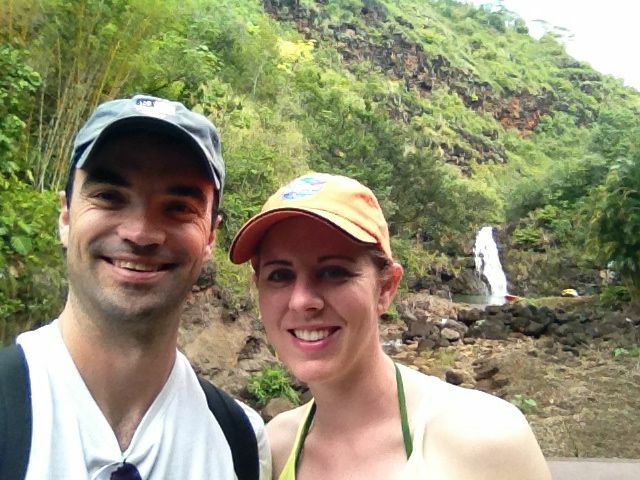 We ate a quick lunch, then drove back up to the North Shore to explore the Waimea Botanical Gardens. The highlight of the gardens was a hike to Waimea Falls. 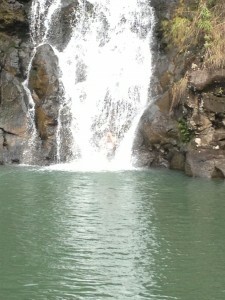 The water was way too cold for me, but Robby jumped in and swam underneath the waterfall. I decided to stay on shore to take pictures. 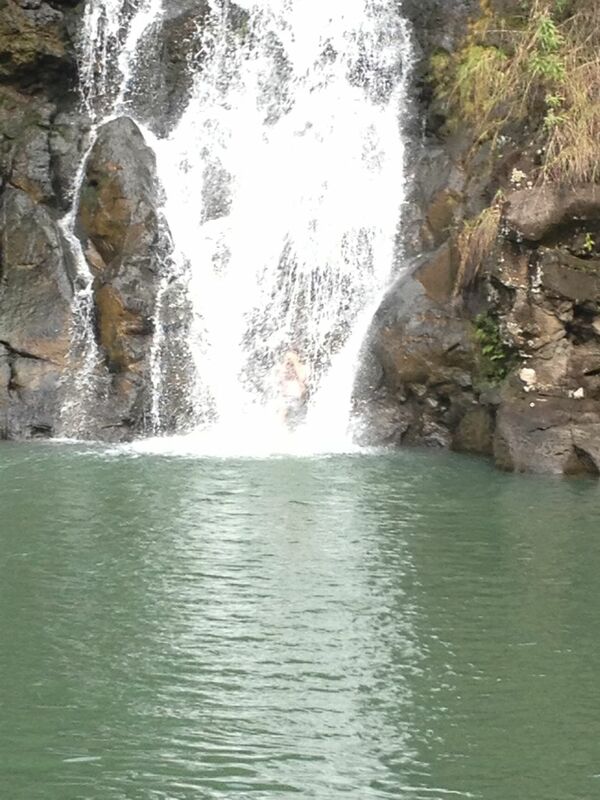 Can you see Robby under the waterfall? After such a busy day, we were tired and hungry. We remedied the hunger at a restaurant called Cheeseburger. 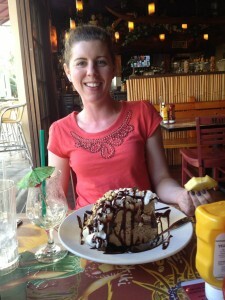 We had cheeseburgers, naturally, and were pleasantly surprised by the great happy hour prices–so much so that we splurged on a giant piece of mud pie! The second cheapest meal of our whole trip (after Costco hot dogs, haha). Since it was our last night in Hawaii, we decided to jump in the hotel hot tub and then wander around a bit before going to bed early again (are you sensing a theme here? I felt like such an old lady going to bed so early every night!). 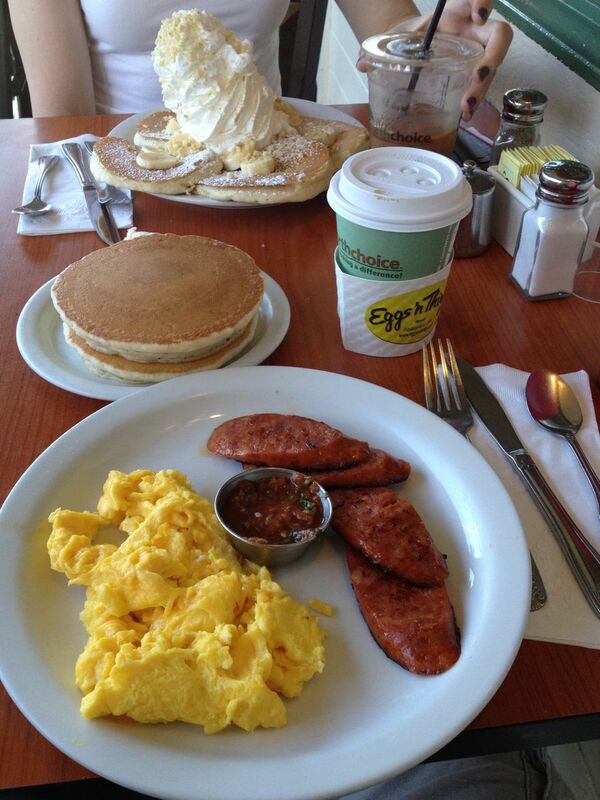 For our last morning of vacation, we treated ourselves to breakfast at a local spot called Eggs ‘n’ Things. Robby enjoyed the Portuguese sausage and eggs, while I devoured the banana pancakes topped with macadamia nuts and about half a can of whipped cream. After breakfast, it was time to check out of the hotel, return our rental car, and wave farewell to Hawaii from the plane. We were sad to leave our tropical paradise, but it was actually kind of nice to sit down for a few hours after 4 activity-packed days! 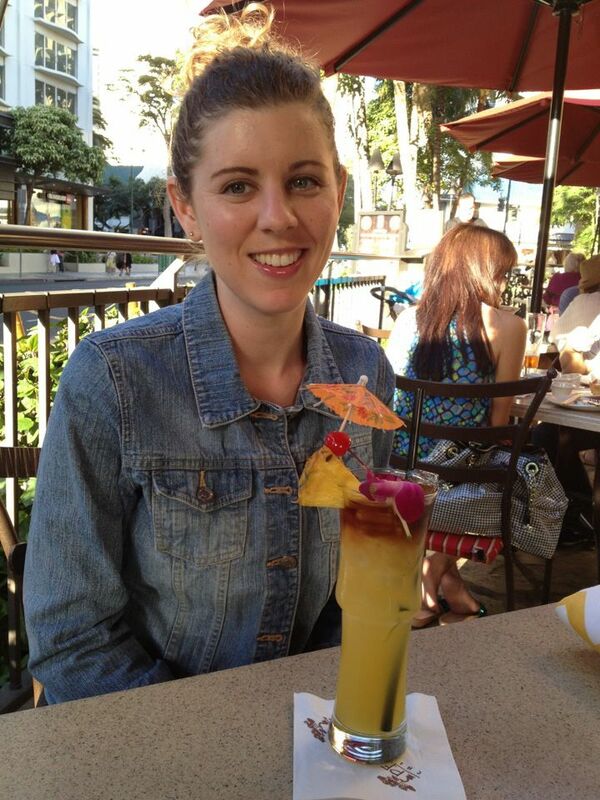 The cold weather and rain we’re having today in Pasadena makes me long for the warm breezes of Honolulu. 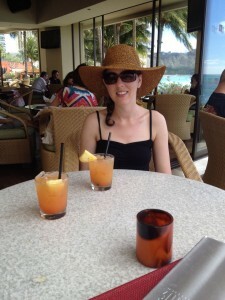 We had a great vacation in Oahu and will definitely be going back someday!